Rémi and Laurence (his wife) Dufaitre began purchasing vines in and around the Brouilly and Cote de Brouilly crus in 2006, he began to work the land organically, and started harvesting the grapes. Rémi began by selling his grapes to the local co-op, all the while monitoring the indigenous yeast population until he felt it was healthy enough to make his own wine. In 2010 he made and bottled his first vintage. When Jean Foillard tasted Rémi’s wine, he immediately sought him out, recognizing the obvious talent that must be behind the wine. Jean has since taken Rémi under his wing, introducing him to his vast and diverse list of Parisian clients. Remi’s wines currently have a very avid following in the bustling Paris natural wine scene as a result of this. Rémi is a member of the informal group that has evolved from Kermit Lynch’s “gang of four,” the producers in Morgon who studied with natural-wine-pioneer Jules Chauvet (winemaker and biologist), making natural wine (Foillard among them). 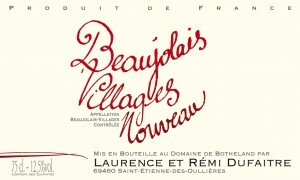 This group has grown to include younger winemakers like Rémi, who are working in the same spirit. 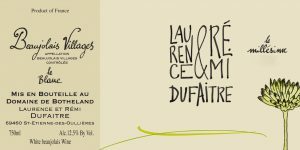 If you find yourself in Villié-Morgon on a Sunday morning or afternoon, take care because this group is likely to envelop you and make you drink Beaujolais all day until the wee hours of the morning! Vinification Method: Grapes are hand harvested, destemmed and fermented in a combination of concrete tanks and used wooden barrels. The wine is aged for a few months longer in those vessels after fermentation is complete, and bottled with zero SO2 added. Tasting Note: This wine has a refined taste reminiscent of much fancier Burgundy, while there is still something that tells you it is not from those famous regions. There is a savory backbone to this wine and it strikes the palate with real force, with a finish that stretches on and on. Vinification Method: The Nouveau is fermented in concrete tanks and bottles quickly to preserve the fresh first taste of the vintage. 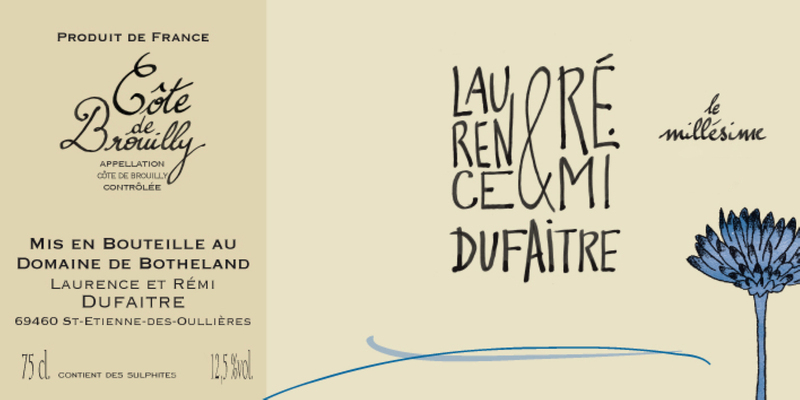 Tasting Note: The Nouveau is always a wine that suggests to us the innocence of young teenage love. That first time in a barn surrounded by a field of wild flowers. Innocent nubile fun! Vinification Method: The Beaujolais Villages is fermented in concrete tanks and normally bottled in March. Vinification Method: The Prémices a parcel of Beaujolais-Villages vines and the grapes are fermented and aged in concrete tanks, with a very short maceration. This is an easy drinking light style of wine. The flower bud on the label represents that this wine is the first flowery taste of the new vintage. 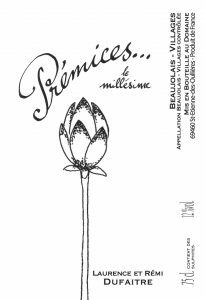 Tasting Note: The Prémices is easy drinking and lighter than the Brouilly and Cotes de Brouilly, but it is anything but a simple wine. The lightness and elegance of this wine is balanced with a healthy dose of minerality and complexity that make this one for serious gamay drinkers. 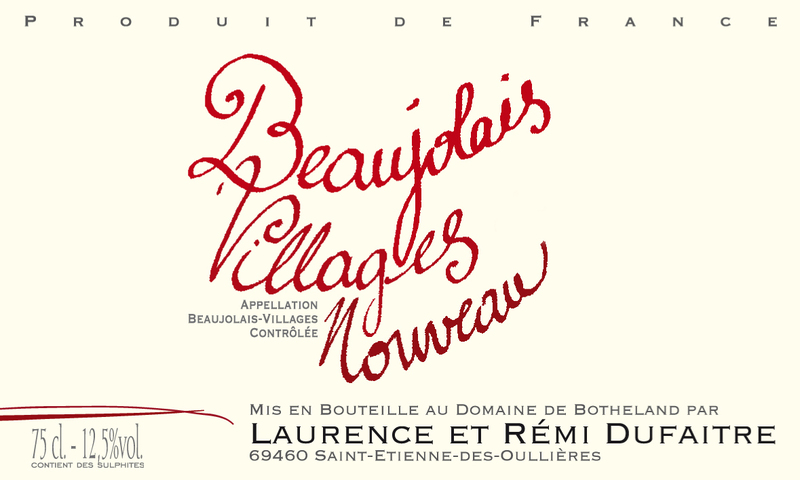 Vinification Method: The Brouilly is fermented in concrete tank, and bottled usually in April. 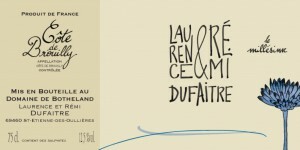 Tasting Note: This Brouilly is bursting with flowers, and while the wine is more muscular than his others, it is one of the most finesse-ful and light Brouilly we have ever tasted. Vinification Method: The Cote de Brouilly is fermented in concrete tanks and then ages in the same tanks for about 6 months. The wine is generally bottled the same time as the Brouilly. Remi has one parcel amongst his Brouilly vines that is on a very steep plot, so steep that the plough must be attached by a pulled cable to work the vines. This vines here struggle harder than their others in Brouilly, due to a lack of moisture. After working the plot for several years and realizing they always picked it one week later than everything else, he decided to vinify it separately from the others, and it is bottled only in magnum. Vinification Method: This wine is fermented in concrete tanks and remains in concrete for about 6 months of aging after fermentation is complete. Zero sulfur added.